Rodrigo "Rody" Roa Duterte (Tagalog: [roˈdɾigo dʊˈtɛrtɛ]; born March 28, 1945), also known as Digong, is a Filipino lawyer and politician who is the 16th and current President of the Philippines. He is the first Mindanaoan to hold the office. At 71 years old, Duterte is the oldest person to assume the Philippine presidency; the record was previously held by Sergio Osmeña at the age of 65. Duterte studied political science at the Lyceum of the Philippines University, graduating in 1968, before obtaining a law degree from San Beda College of Law in 1972. He then worked as a lawyer and was a prosecutor for Davao City, a highly urbanized city on Mindanao island, before becoming vice mayor and, subsequently, mayor of the city in the wake of the Philippine Revolution of 1986. Duterte was among the longest-serving mayors in the Philippines, serving seven terms and totaling more than 22 years in office. Duterte's political success has been aided by his vocal support for the extrajudicial killing of drug users and other criminals. Human rights groups have documented over 1,400 killings allegedly by death squads operating in Davao between 1998 and May 2016; the victims were mainly drug users, petty criminals and street children. A 2009 report by the Philippine Commission on Human Rights confirmed the "systematic practice of extrajudicial killings" by the Davao Death Squad. Duterte has alternately confirmed and denied his involvement. The Office of the Ombudsman closed an investigation in January 2016 stating that they found no evidence that the Davao Death Squad exists, and no evidence to connect the police or Duterte with the killings. The case has since been reopened. Duterte has repeatedly confirmed that he personally killed three kidnapping suspects at a police checkpoint while Mayor of Davao in 1988. On May 9, 2016, Duterte won the Philippine presidential election with 39.01% of the votes, defeating four other candidates, namely Mar Roxas of the Liberal Party (23.4%), Sen. Grace Poe of the Nationalist People's Coalition (21.6%), former vice president Jejomar Binay of the United Nationalist Alliance (12.9%), and the late Sen. Miriam Defensor - Santiago of the People's Reform Party (3%). During his campaign, he promised to reduce crime by killing tens of thousands of criminals. His domestic policy has focused on combating the illegal drug trade by unleashing a deadly crackdown on the suspected sale and use of drugs. According to the Philippine National Police the death total passed 7,000 in January 2017, after which the police stopped publishing data. Following criticism from United Nations human rights experts that extrajudicial killings had increased since his election, he threatened to withdraw the Philippines from the UN and form a new organization with China and African nations. He has also declared his intention to pursue an "independent foreign policy", and sought to distance the Philippines from the United States and European nations and pursue closer ties with China and Russia. Education. Duterte went to Laboon Elementary School in Maasin, for a year. He spent his remaining elementary days at the Santa Ana Elementary School in Davao City, where he graduated in 1956. He finished his secondary education in the High School Department of the then Holy Cross College of Digos (now Cor Jesu College) in today's city of Digos in the now defunct Davao province, after being expelled twice from previous schools, including one in Ateneo de Davao University (AdDU) High School due to misconduct. He graduated in 1968 with a Bachelor of Arts degree in political science at the Lyceum of the Philippines in Manila. He obtained a law degree from San Beda College of Law in 1972. In the same year, he passed the bar exam. Duterte eventually became Special Counsel at the City Prosecution Office in Davao City from 1977–79, Fourth Assistant City Prosecutor from 1979–81, Third Assistant City Prosecutor from 1981–83, and Second Assistant City Prosecutor from 1983–86. The Presidency of Rodrigo Roa Duterte, also known as the Duterte Administration, began on June 30, 2016 following his inauguration as the 16th President of the Philippines, succeeding Benigno Aquino III. Congresswoman Leni Robredo from the 3rd district of Camarines Sur also took office as the 14th Vice President of the Philippines on the same day, succeeding Jejomar Binay. 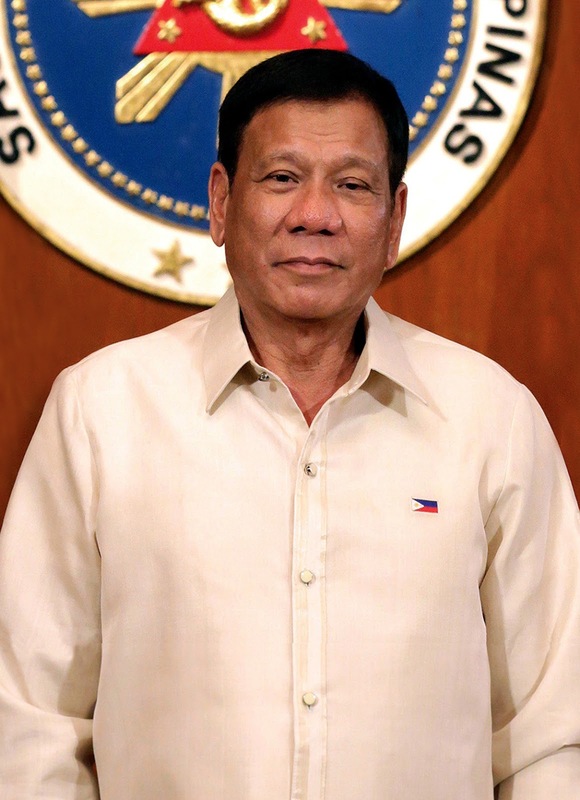 Rodrigo Duterte is the first president from Mindanao and the oldest person to be elected president of the Philippines. He is also the first graduate of Lyceum of the Philippines University and San Beda College of Law to become president,the first president who had his marriage annulled, the first motorcycle-riding president, the second Cebuano to become president (the first being Sergio Osmeña), the third Cebuano-speaking to become president (the first being Osmeña and second was Carlos P. Garcia), the fourth Visayan to become president (the first was Osmeña, second was Manuel Roxas, and the third was Garcia) and the third mayor (of Davao City in his case) to be elected president (the first former-mayor president was Emilio Aguinaldo of Cavite El Viejo, and the second was Joseph Estrada of San Juan, Metro Manila).